There are many aspects to Southampton Ukulele Jam. We are, in equal parts, a jam, a community, a social club, a ukulele ‘boot camp’ and a gigging band. We endeavour to be a force for good; supporting worthwhile causes, raising money for charity and promoting tolerance, acceptance and diversity by playing good songs with more enthusiasm than ability on tiny instruments. Musically, we steer clear of traditional ukulele tunes, preferring instead to delve into a repertoire that runs from Kylie Minogue to The Clash via The Vaccines and Lady Gaga. Everyone in the Jam gives their time for free, but, by asking for charitable donations for private or funded events, the Jam have been able to raise thousands of pounds for charity since we started in 2008. We do our best to adhere to the “everyone is welcome, anyone can do it” ethos that we think is central to playing the ukulele. As a result we have a thriving Beginners and Improvers group and hold an Open Jam every other Monday at The 1865 in Southampton. The bottom line is that we do what we like and we like what we do. With us, fun is always the winner. Come join the mayhem. You are most welcome. 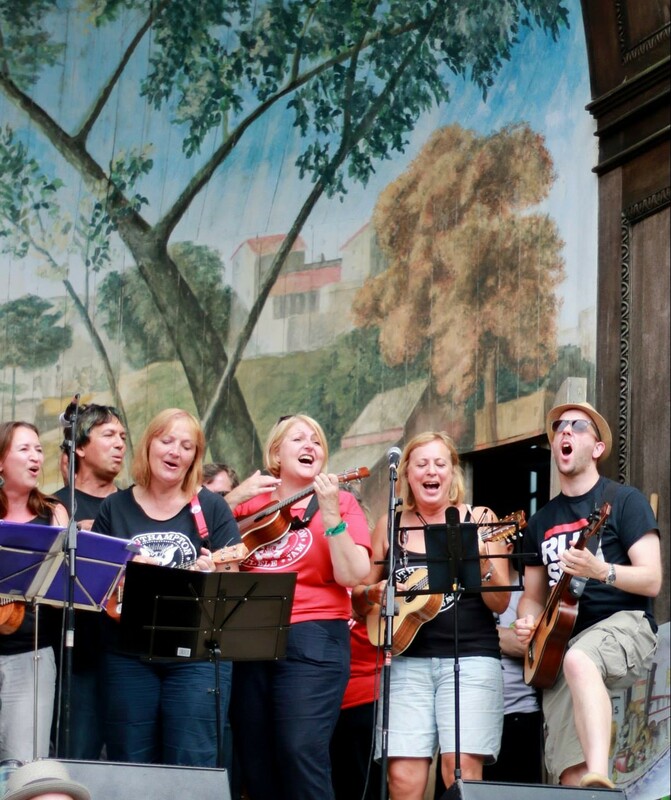 Joining the Southampton Ukulele Jam couldn’t be easier. There are no membership fees, nothing to sign, no auditions. You can just turn up at any one of our sessions and join in. Open Jam nights – these are held in the The 1865 in Southampton. There is a £1 voluntary contribution to the venue. Beginners and Improvers Group – see the Beginners and Improvers page for more details. There is a £2 cover charge for this group. All of the song sheets that you need are available to download from the Songs area of the website or by clicking the titles below. Feel free to turn up and join in. Songs marked with a ✪ have had their sheets updated within the last month. Voluntary donation of £1 to pub. There is nothing to pay or any forms to fill in…. we just ask you to put a pound in the pot, if you can afford it – this money goes directly to the pub – and buy a drink – non alcoholic drinks are available. Try to listen to the songs, if you can, before the jam…… But don’t worry if you dont!